I’ve never been a big fan of bling for bling’s sake, so I found the look and feel of the new MDR-Z1R headphones refreshing. They are elegant in the true sense of the word, with clean lines and an all-black matte finish that seems to say, “Stop looking and start listening.” Instead of flashy logos or sparkly details the MDR-Z1R is all about understated high performance. Designed by Shunsuke Shiomi, the MDR-Z1R headphones are a completely new design based around a 70mm-diameter, full-range driver. With its high frequency extending up to 120kHz, the new driver comprises a magnesium dome attached to an aluminum-coated, liquid crystal polymer edge. Even the screen that protects the drivers was given a new design. 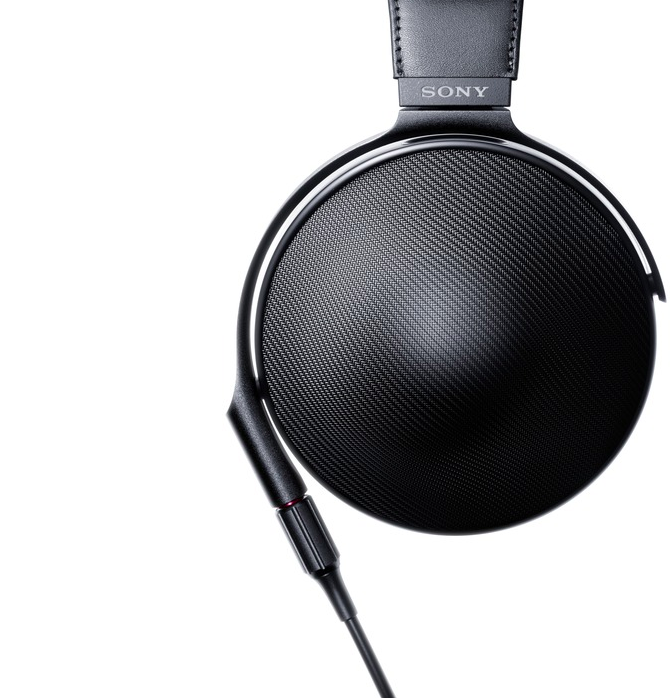 Instead of the usual circular or grid pattern the MDR-Z1R uses a Fibonacci-patterned grille. According to Sony’s measurements this grille delivers a much smoother frequency response with fewer resonances than previous grille designs. On the Sony-supplied frequency plot, the Fibonacci grille caused almost as few frequency anomalies as no grille at all. Moving up to a 70mm-diameter driver isn’t merely a matter of bigger looks better. With the larger driver the MDR-Z1R gains several advantages. For one, the driver doesn’t have to be positioned as critically vis-à-vis your ear. Most headphones, even large-diaphragm models, have one particular or ideal fit where sound and comfort are optimal. With the MDR-Z1R I found that the time I spent fiddling to find the fit with the best sound was reduced to nothing. The MDR-Z1R sounds the same regardless of small changes you make to how they are sitting on your head. This is also due to the new Fibonacci screen. The MDR-Z1R’s enclosure is also worthy of special note. Unlike most headphone designs which are either completely closed or completely open, the MDR-Z1R is somewhere in between, not unlike the AudioQuest NightHawk. The MDR-Z1R has an open housing frame that allows sound to pass through freely. This is backed by an “acoustic resistor” that is made of Canadian softwood mixed with water to a uniform consistency. The process is similar to what is used to form art-paper, but in this case the final results are geared toward producing a material that has a high level of sound absorption rather than textural beauty. The outer layer of this sandwich is a “housing protector” molded out of stainless steel wire coated with a chromium compound. This design delivers the sonic advantages of an open headphone so that the driver has no physical impedances caused by the enclosure. But it also reduces the sound released into the world around you to the point where at normal listening levels anyone nearby will not hear your music. The MDR-Z1R has thick, ergonomically shaped, genuine leather earpads that are so pliable that the headphones can make a fully occluded seal around a user’s ears even when he is wearing glasses. This same leather is used to cover the “Beta titanium” headband, the inner core of which is made of the same material used in eyeglass frames. The MDR-Z1R design has two pivot points, a vertical one where the capsules meet the headphone’s yoke and a second lateral point where the yoke meets the headband. This two-point pivot system makes for an exceptionally flexible fit and a very comfortable final result. As you would expect from a premium headphone, the cable is removable and replaceable. The attachment methodology is one that Sony has used successfully on previous designs. It has a male stereo mini-connector augmented by a screw-down outer collar. This configuration guarantees a virtually unbreakable connection; if the cable fails, the points of attachment will not cause it. The MDR-Z1R comes with two cables. One is a standard 3-meter-long, single-ended mini-stereo (with a full-sized ¼" adapter) while the other is a 1.2-meter balanced cable terminated with the new 4.4mm barrel. Because of its 70mm diaphragm the MDR-Z1R is a physically large headphone, and if you are concerned by questions such as “Do these make my head look small?” be advised that the all-black color of the headphones does have a slimming effect. But despite its size the MDR-Z1R is surprisingly lightweight. On a comfort scale of one to ten—one being unwearable and ten being so comfortable you forget they are on your head—the MDR-Z1R rates a solid 9. Even after several hours of use in a reasonably warm environment my ears did not get overly moist and the side-pressure did not become uncomfortable (or even noticeable). I rate the MDR-Z1R up with the Focal Utopia and Stax L-700 in overall comfort and wearability. With its 64 ohms at 1kHz impedance and 100dB at 1mW sensitivity the MDR-Z1R is an easy-to-drive headphone. My iPhone 4 had no issues pushing the MDR-Z1R to satisfying levels, as did my ancient iPod Classic 160. The most noticeable difference between these sources and more robust portable players was the level of bass control, definition, and extension. I could also hear that these sources lacked the finesse and delicacy in their upper frequencies of the Sony NW-WM1Z. The MDR-Z1R comes in a large, leather-bound presentation case complete with a firmly closing clasp. It seems that it is pretty much a given that any premium headphone will be packaged in a similar manner. Many audiophiles, including this reviewer, would prefer a case that could be used in the field rather than an elaborate non-portable case that takes up valuable shelf space. It would also have aided the MDR-Z1R’s portability if the lateral pivots allowed the headphones to lay flat for travel. Going with a less expensive packaging scheme would have also freed up some funds so that Sony could have included a third and in my opinion essential cable: one with a standard balanced XLR connection. You can, of course, obtain a cable with this termination from other sources, but it would be nice to be able to start using the MDR-Z1R in a balanced mode with virtually any amplifier right out of the box.